I had a flat so I went to change to the spare and broke the lug nut off in the wheel. I cant remove the flat to replace it now. I was told to drill it out. I tried this is the result. Ant tips? Year, make, model, and engine? 2001 honda civic ex v6. Aftermarket wheels. Well that wheel is off to the crap heap now. Unbolt the wheel bearing and get the whole assembly off. What happened to you is that the splines of the stud aren't holding their grip in the hole and have now spun in their hole. Once you get the bearing, brake drum and wheel off together you can take a grinder to the back of the stud and grind it down until the thing falls out. You will want to replace the hub most likely if a new stud doesn't hold into the hole well enough. Had a similar issue with a Jeep once. After pulling the axleshaft out I tack welded the back of the stud to allow me to get the nut off. Your wheel uses a tapered nut to hold and center it. That drilling has taken that away. The wheel needs to be scrapped, it cannot be reused now. Problem is the wheel bearing is pressed into the knuckle and the hub flange is pressed into the bearing. 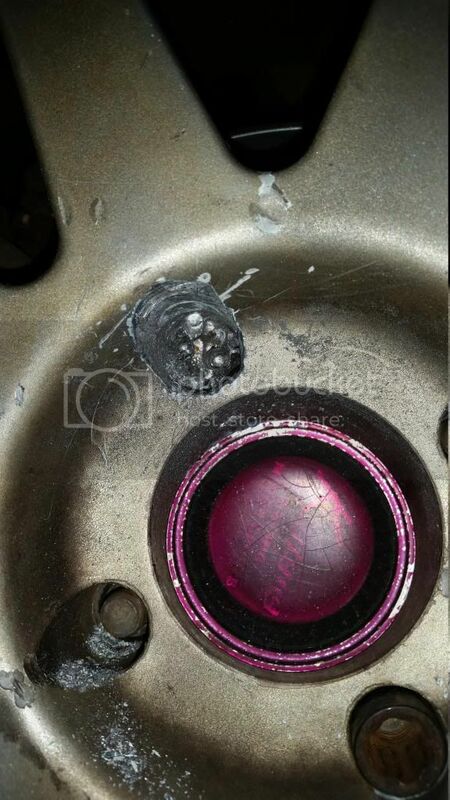 If the wheel isn't magnesium, you maybe able to use a cutting torch to melt the remander of the nut. I'd take the valve core out before doing that. If your not sure it is magnesium, scrape some shavings off the wheel and see if it burns when you hit it with the torch.